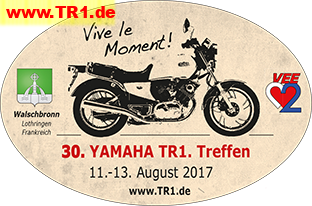 Many thanks to Wolfgang Rau who designed the 2017 sticker. At Friday, Pouya Nemati played with his band Acoustic Fight. Ali joined them after the break with a bass guitar. He earned a lot of applause. Only a Greek-Austrian dance gig, as in 2013, was missing. Roberto Boscarini, an Italian from Treviso near Venice, was for the first time at a TR1 rally. The poor guy was so tremble at the registration (he came over the Stilfser Joch) that he got a room to sleep. Marc Segura came back from Lyon with his daughter, who in 2005 in Walschbronn was a little girl. She could still remember well. She currently does a film education. Therefore she filmed a lot and interviewed Christian and Herbert. In the evening, there was tarte flambée and grilled sausages in the baguette. The atmosphere was great despite the humid weather. Heike and Herbert were in bed very late at about 6:30. On Saturday there were three trips. One with Christian about 200 km in the Vosges (no rain) and one with Jerome also about 200 km (slight rain) and a short one with Willi Meckes to the Citadel in Bitche. But he did not tell that he and Herbert were part of a film about the German-France war, which is shown there. But some have noticed it. Kevin Emery decided to make a trip alone by himself and was promptly left in Dahn with a plate on the rear tire. He came back by taxi. Christian Knies then picked up his bike. The next morning, Woody, who had a spare hose, and Rinie (left) repaired his TR1. Kevin was astonished quite a bit, when they pushed the tire inside the rim, they simply put another TR1 with the main stand on it. Saturday was Seba's well-known and great buffet and later also a camp fire. In the afternoon two trophies were given, which Kevin Emery donated and produced. It was a polished, empty carburettor housing on an oak board with engraved brass plate. One for the oldest driver who came with a TR1, with the inscription "Still crazy after all these years". The winner was Willi Meckes. For the other prize, elections were held with the question "Which TR1 would you like to own besides your own?" Inscription "Owner of the most wanted TR1". Award winner was Ebi (foreground right) from Lake Constance (travelled with Sepp). This is the winning bike from Ebi. On Sunday, some of the visitors drove to the Le Camping Moto. Check Kevin's pictures below. Herbert and the other organizers said it was exhausting, but everything came back through friendliness and recognition. All the helpers were great, even people from the village were there and everyone knew what to do without words. From the village people also came the feedback, that all visitors were very nice. Click the playlist icon to show 1 more video. Navigate using the and signs.